Freeform, or dead bug style, electronics intrigues me. It can be the quick route for simple circuits, but to Kimio Kosaka, simplicity and ease of assembling was not the end goal. His amazing Metaboard-based design can even use shields. “0’baka Project” means a stupid project. This project is to make things which is not art and which is not usable. Now, I am making Arduino skeleton by using steel wires. 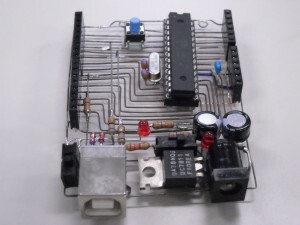 This entry was posted in Arduino, Electronics. Bookmark the permalink.